It's not that simple, of course. 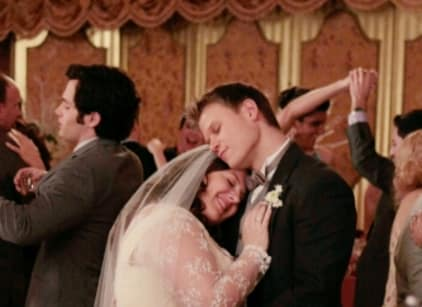 They still dispute who’s at fault for what happened with Jack, and his plot to throw Dorota a lavish wedding to win her over may not fly. Vanya and Dorota happily wed, with Chuck and Blair as the "happy couple" that the ceremony requires participate. But after, B tells C she can't be with him anymore. She just loves him too much. Meanwhile, Jenny is doing all she can to break up Nate and Serena, and Serena is not helping her own cause by secretly meeting up with none other than Carter Baizen. Nate catches them sneaking around and S lies. Later, S explains to Nate that Carter knows something about her dad, and after distrustful Nate tells her not to see him. At Dorota’s wedding, Carter shows up and tells Serena that he knows where her dad is and has been this whole time: Palm Beach, Florida. He also bought her a ticket. When Serena learns he held out on that info for a week just to have an excuse to see her, she goes to Florida solo, though, and calls Nate to tell him she loves him. Jenny answers the phone and S asks Jenny to please have Nate call her, and to relay that message. Yeah. No way that's gonna happen there, S. What is J's deal? Eric and his new crush, Elliot, are also featured this week. E learns has a girlfriend, but is actually bisexual ... with a crush on Eric. Hopefully that works out for E! Finally, Rufus can't get a hold of his wife and CeCe won’t tell him where Lily is either, despite her claims of going to Canyon Ranch. Rufus remains clueless at the end. The final scene? Serena knocks on the door to what we assume is her father’s hotel in Florida, and Lily answers, wearing nothing but a robe. Wow. Amazing stuff.